Bacon wrapped chicken stuffed with Cream Cheese and Spinach! 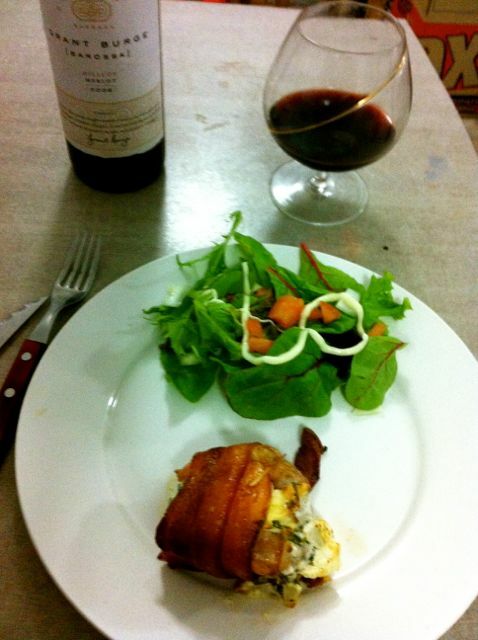 Last night we broke out the red wine and cooked up a yummy dinner! It was a very simple and fairly quick to make! We had chicken, cream cheese, and wine already so altogether this meal only cost me 11! And it was an 11 bucks well spent. For appetizers we had toast covered in a thin layer of cream cheese with fresh smoke trout on top (trout has that same nice flavor as smoked salmon but you can get it at a more reasonable coast at WoolsWorth). 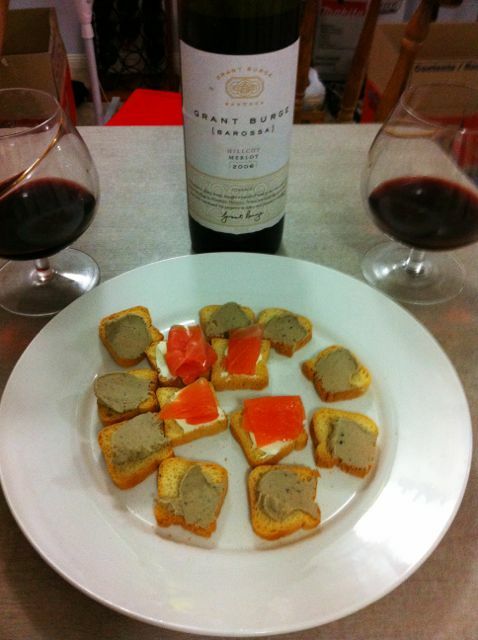 This was accompanied by toast covered in a wild mushroom and cracked pepper duck pate (You can pick this pate up at Woolsworth for around 4 dollars) We enjoyed these with a bit of Merlot that my partner picked up while he was in Adelaide. Preheat your oven to 180. First chop up your spinach a bit and dice your onion into small pieces. Place a tablespoon of oil in your skillet and sauté the onion and spinach until the onion is clear and the spinach is tender. Season with a bit of salt. Remove from the skillet and soak up excess oil with a paper towel. Place Spinach and onion into a bowl and mix in your cream cheese until it is well combined. 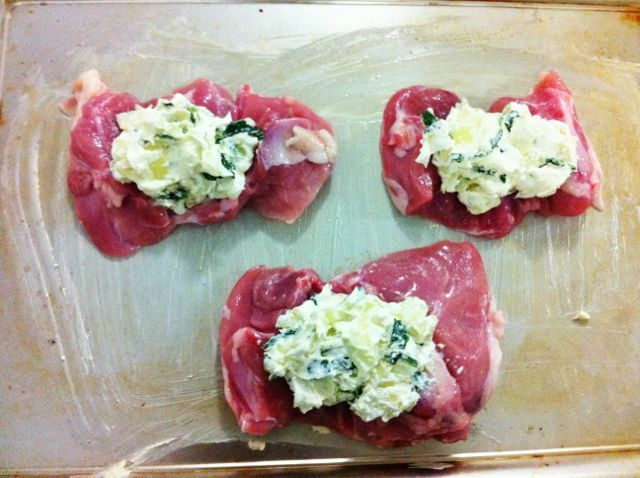 Take your chicken breast out and lay them open. Put two decent size table spoons of the mixture in each chicken breast (more or less if you’d like) Place bacon underneath chicken breasts and roll it up and secure with a tooth pick. Place on greased backing sheet and cook for 30 minutes or until chicken juice runs clear. Serve with a light salad and enjoy! If you enjoyed this recipe please connect with me by following, commenting, or just a +! You can also find me on Facebook and Twitter and keep up with when I post new recipes!